Download "Genders and Sexualities in History"
9 Acknowledgements ix I would also like to thank the staff and faculty at the history departments of the University of Cambridge, Memorial University of Newfoundland, McGill University and Birkbeck College, each of whom provided a home for this project at different stages in its development, and to the staff at the various libraries and archives in which I researched, especially the National Archives, the Women s Library, the Wellcome Library and the Cambridge University Library. During my doctoral studies I enjoyed the generous financial support of the Commonwealth Scholarship, and later I was awarded postdoctoral fellowships from Memorial University s Faculty of Arts and the Social Sciences and Humanities Research Council of Canada, which have been crucial in enabling me to finish my manuscript. A generous grant from the Scouloudi Foundation has assisted me with the costs of publication. I have also been blessed with friends who have offered me support of a less academic and quantifiable kind, and I would like to thank Alban Rrustemi, for the trilogy in an ongoing number of parts; and Jennifer Grant and David Dattells, Catherine McGuirk, and Rose and Peter Collett for sharing their lovely homes with me when I ve been researching in London. I would also like to make special mention of Amanda Hewitt and Théa Morash, and thank them for their lifelong love, support and friendship. Last, but undeniably not least, I would like to thank my family: my grandparents, Olive and Jacob Button, who have inspired me in ways I do not believe they realize; my cousins, for reminding me always to remember the story; and my sister, Katherine Laite, for being so cool. A thousand thanks go to my partner, William Alcock: his skill, patience and love during these years have kept my computer working, my head above water and a very big smile upon my face. Finally, I would like to thank my parents, Linda and Stanley G. Laite, and dedicate this book to them, in recognition of their unending love and support. 10 Map 1 Police divisions in London, c Divisions: A: Hyde Park and Whitehall B: Chelsea C: Piccadilly and St. James D: Marylebone E: Holborn F: Paddington G: Finsbury H: Whitechapel J: Bethnal Green K: Bow L: Lambeth M: Southwark N: Islington P: Camberwell R: Greenwich S: Hampstead T: Hammersmith V: Wandsworth W: Clapham X: Highgate Y: Kilburn City Police administered separately. Key stations: 1: Vine Street Station (West End, C; later moved to West End Central Station, Saville Row) 2: Great Marlborough Street Station (West End, C) 3: Tottenham Court Road Station (North Soho, D) 4: Hyde Park Station (Hyde Park, A) 5: Canon Row Station (Victoria, A) 6: Kennington Road Station (Waterloo, L) 7: Leman Street Station (Whitechapel, H) 8: Woolwich Station (Woolwich, R). Source: Based upon a digital scan of London s Police Divisions and Railways, Bacon s Citizen Series Maps of London (London, 1910); designed by the author. 11 Map 2 Arrests for solicitation in London, Key stations: 1: Vine Street Station (West End, C; later moved to West End Central Station, Saville Row) 2: Great Marlborough Street Station (West End, C) 3: Tottenham Court Road Station (North Soho, D) 4: Hyde Park Station (Hyde Park, A) 5: Canon Row Station (Victoria, A) 6: Kennington Road Station (Waterloo, L) 7: Leman Street Station (Whitechapel, H) 8: Woolwich Station (Woolwich, R). 1 dot =10 arrests. Notes: Dots are placed randomly according to statistics for each police station and do not represent actual locations of individual arrests. Sources: Based upon a digital scan of London s Police Divisions and Railways, Bacon s Citizen Series Maps of London (London, 1910); designed by the author. Arrest statistics from Royal Commission on the Duties of the Metropolitan Police, Return C, 1906. 12 Map 3 Arrests for solicitation in London, Key stations: 1: Vine Street Station (West End, C; later moved to West End Central Station, Saville Row) 2: Great Marlborough Street Station (West End, C) 3: Tottenham Court Road Station (North Soho, D) 4: Hyde Park Station (Hyde Park, A) 5: Canon Row Station (Victoria, A) 6: Kennington Road Station (Waterloo, L) 7: Leman Street Station (Whitechapel, H) 8: Woolwich Station (Woolwich, R). 1 dot = 10 arrests Notes: Dots are placed randomly according to statistics for each police division and accompanying descriptions of areas, and do not represent actual locations of individual arrests. 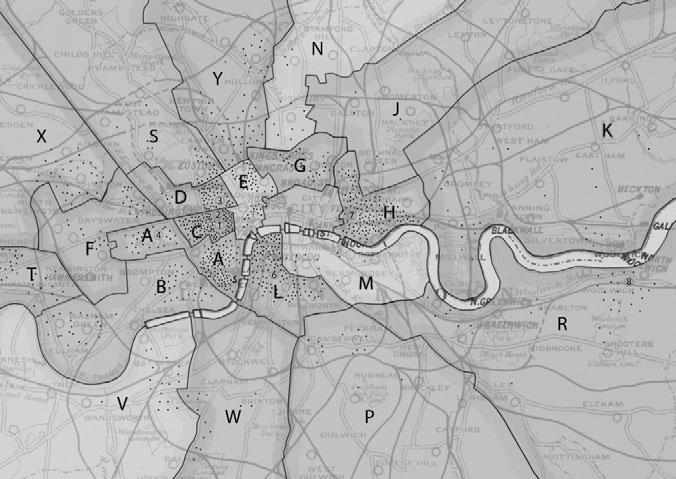 Sources: Based upon a digital scan of London s Police Divisions and Railways, Bacon s Citizen Series Maps of London (London, 1910); designed by the author. Arrest statistics from an unpublished police return, in London, The National Archives, MEPO 2/1720. 13 Map 4 Arrests for solicitation in London, Key stations: 1: Vine Street Station (West End, C; later moved to West End Central Station, Saville Row) 2: Great Marlborough Street Station (West End, C) 3: Tottenham Court Road Station (North Soho, D) 4: Hyde Park Station (Hyde Park, A) 5: Canon Row Station (Victoria, A) 6: Kennington Road Station (Waterloo, L) 7: Leman Street Station (Whitechapel, H) 8: Woolwich Station (Woolwich, R). 1 small dot = 10 arrests 1 large dot = 1000 arrests Notes: Dots are placed randomly according to statistics for each police division and accompanying maps and descriptions of areas, and do not represent actual locations of individual arrests; C Division arrests, which constitute 65 per cent of the total for London over the three year period (16,378 arrests), have been represented with large dots (equalling 1000 arrests) as well as small ones (equalling 10 arrests). Sources: Based upon a digital scan of London s Police Divisions and Railways, Bacon s Citizen Series Maps of London (London, 1910); designed by the author. Arrest statistics from unpublished police returns in London, The National Archives, MEPO 2/9713.